Four new CPUs for enthusiasts, but not so much for gaming. Disclaimer: this is a long piece, with a ton of data and a lot of other miscellaneous details. If you like such things, great, but if you're looking for a short opinion on each of the new Broadwell-E processors, I'll be putting those up over the coming week, in 1000 word installments (give or take). The reason for this massive article is to provide a place I can link back to in those articles, a place with all the benchmarks basically. Clear as mud? Let's continue…. Broadwell-E wafer with lots of chips just waiting to be used and abused. The past two months in hardware news has been insane. Nvidia launched their GTX 1080 and GTX 1070, Intel released Broadwell-E, and AMD launched RX 480. And we're not done yet, as GTX 1060 is coming, along with the Radeon RX 470 and RX 460. Whew! To the matter at hand, while I previewed the high-end 10-core i7-6950X Broadwell-E already, testing of other platforms and CPUs wasn't complete at the time, and I wanted more comparison points. One thing was clear, however, and it's something I want to emphasize: No matter what you might think or hear, the Broadwell-E processors aren't built for gaming enthusiasts. Wait, what? How can it be that the fastest CPUs that Intel makes aren't for gamers? It's pretty simple, really. Intel split their CPU line into various market segments years ago, with 'professional' Xeon parts intended for workstations and servers on the one hand, and 'consumer' parts (Celeron, Pentium, and various iterations of Core processors) that are intended for typical home users, gamers, and regular business PCs on the other. There are other splits as well, like mobile vs. desktop, but that's a topic for another day. If the difference in naming wasn't enough, Intel took things a step further when they introduced the Core i7 (aka Nehalem) in November 2008. Back then, Intel created a new platform, LGA1366, with the Bloomfield processors (1st Gen Core if you're keeping track). The following year, in September 2009, Intel launched their consumer LGA1155 platform with the Lynnfield chips (still 1st Gen Core). Without getting too bogged down in the details, the main difference was that the enthusiast platform was limited to Core i7 parts, along with some professional single-socket Xeon parts, and it also supported triple-channel DDR3 memory. The consumer platform was able to trim down the number of pins on the socket by dropping to a dual-channel memory controller, there were Core i5 and Core i3 (and later Celeron and Pentium) parts, and the LGA1155 parts also included Intel's integrated HD Graphics solution. Thanks to fewer cores, the consumer line also tends to sport higher clock speeds, which helps things like gaming. Since that time, Intel has had two largely separate platforms in terms of supported processors, but with lots of areas of overlapping performance. The enthusiast side has focused on increasing core counts, larger L3 caches, more memory channels, and additional PCI Express lanes. The consumer side has been more about providing 'enough' performance, and doing so at sometimes significantly lower price points. After a bunch of names describing all the different parts in the first generation (Bloomfield, Lynnfield, Clarksfield, Clarkdale, Arrandale, and Gulftown are all 1st Gen Core), Intel settled into a more sensible naming scheme. For the consumer side, we've had Sandy Bridge (2nd Gen, 32nm), Ivy Bridge (3rd Gen, 22nm), Haswell (4th Gen, 22nm—and the Devil's Canyon refresh as well), Broadwell (5th Gen, 14nm), and now Skylake (6th Gen, 14nm). The enthusiast/professional side has used the same architecture names, only with an '-E' suffix, as in the Broadwell-E parts we're looking at today. The new processors use the same X99 socket and LGA2011-3 platform as the previous generation Haswell-E parts, and the majority of X99 motherboards should all have updated firmware that allows them to run the new parts. That's the good news. The bad news is that other than the king-of-the-mountain i7-6950X, the new chips aren't radically different from what we had before. The i7-6800K replaces the i7-5820K, i7-6850K replaces i7-5930K, and i7-6900K replaces i7-5960X. Except the word 'replaces' is perhaps too strong, as there's not necessarily a big jump in performance or features, and the pricing on the new Broadwell-E chips is higher than the old Haswell-E equivalents. Despite the apparent lack of changes, however, Broadwell-E differs from Haswell-E in many ways. First and foremost, it's built on a 14nm process technology instead of 22nm. The smaller process actually ends up making for a significantly smaller chip—246 mm^2 on BDW-E compared to 356 mm^2 on HSW-E. 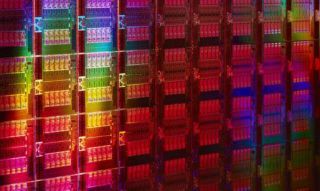 But it's more expensive to manufacture 14nm processors than 22nm parts, so even though Intel can get more chips out of a single silicon wafer, the cost per usable chip probably isn't much lower. I said earlier that these new processors really aren't for gaming enthusiasts, and here's why. Despite having higher core counts, larger L3 caches, and more PCI Express lanes, in practice there's very little reason to opt for X99 over the new Z170 platform. In fact, once we get to the benchmarks, you'll find that there's also very little reason for existing X99 users to upgrade from Haswell-E to Broadwell-E. There's one exception to that rule, and that's for people that use (and by use, I mean use regularly, preferably as a daily part of their work) applications that can benefit from higher core counts. For them, the i7-6950X might be tempting.